The team at Bristol Street Motors Vauxhall Chingford have joined together to celebrate a colleague's 47 years of loyal service. 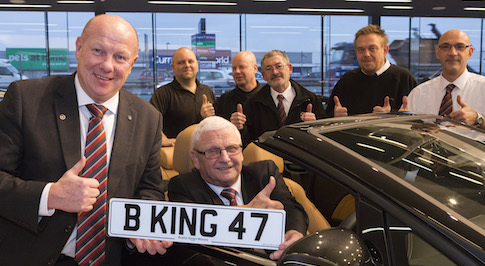 Barry King, 66, began his career in the motor trade in 1967 working in the parts department. He later moved to a position in the workshop and is now a warrantee administrator. Barry, who also has experience as a Service Manager, is well known for his valuable knowledge in Aftersales and is often called upon by colleagues for his expertise. After joining the motor trade straight from school, Barry has always had keen interest in cars. He has always worked with Vauxhall and is impressed at how the manufacturer has advanced over the years. In his spare time, Barry is a keen gardener and he also likes attending theatre shows. Colleagues at the Shadbolt Avenue dealership organised an all expenses paid trip for Barry to attend a showing of the hit musical Jersey Boys in London as a thank you for his many years of loyal service. Kevin Herridge, General Manager at Bristol Street Motors Vauxhall Chingford, said: "Barry is such a valuable and popular member of our team. His knowledge and experience is priceless and everybody at the dealership was delighted to celebrate his impressive work anniversary." Barry, said: "I really enjoy my role at Bristol Street Motors Vauxhall Chingford and work with a great team. I've seen many changes over the last 47 years but the importance of maintaining a high level of customer service has always stayed the same. "I very much appreciate the effort everybody has put in to ensure my 47th year of service is memorable and I am really looking forward to seeing Jersey Boys."